Roon’s Nucleus+ music server packs power for a home network. Noel Keywood gets involved. Last month, in a feature explaining Roon – software that catalogues music and distributes it in the home – I ran it from my Mac com­puter. Inexpensive at $ for one year, it was quick and easy to use – but not so good when the computer is turned off! Roon recom­mend use of their always-on Nucleus dedicated server to deliver music over a home network. Here is their top Nucleus+. It isn’t a simple network-attached storage (NAS) drive so much as full blown, customised Intel NUC com­puter running Roon’s own operating system/server software – a different experience to Roon on a home com­puter I found. Nucleus server sends music to your hi-fi over a network via wired Gigabit ethernet only. 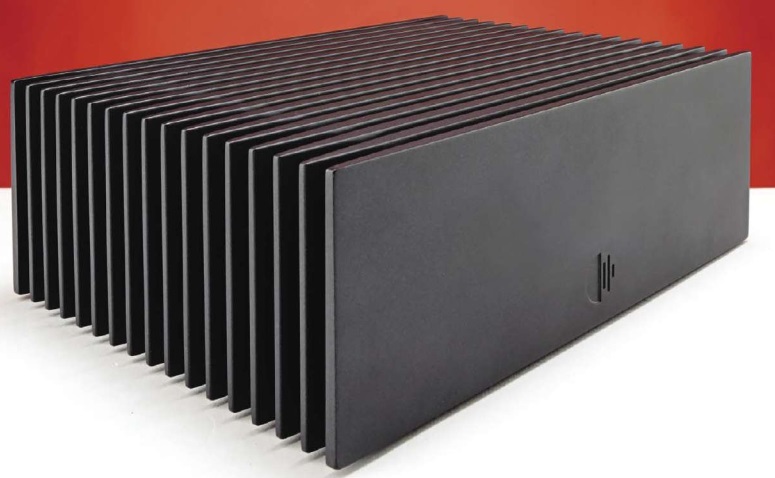 It can send from its own storage drive, from network attached storage, or from an external music source such as Qobuz or Tidal Masters (MQA encoded), to quote two that offer audiophile quality. Control is from a wi-fi connected iPad ideally, so both the cover artwork and music history can be read easily whilst listening. The obvious parallel is viewing LP cover art and sleeve notes whilst the disc spins. To simply summarise, Roon plays music from computer storage under the control of an iPad or mobile phone, sending it to the hi-fi over an ethernet network cable. So receiving devices must have ethernet access. Currently, many DACs don’t – but that is changing. Gathering data from on-line sources and assembling it for tablet presentation needs computing power Roon say, and Nucleus is designed to run the software effectively for stable, reliable, upgradeable and audiophile performance. Impressively, Roon are so audiophile orientated they even talk about the possibility of Nucleus running from a linear power supply rather than the switch-mode wall- wart supplied. I nearly fainted. 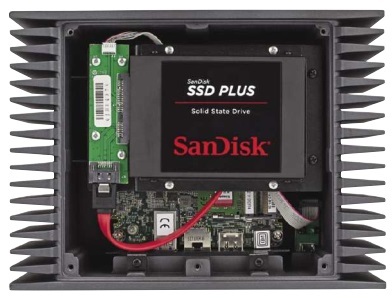 Internally, Nucleus+ has an Intel NUC motherboard and a SanDisk 64GB Solid-State Drive (SSD) – no whirring sound, but modest in size. Capacity can be increased by external Flash Drive or Terabyte hard drive, or internal hard-disc drive (HDD). 2.5kgs and size 212mm wide, 156mm deep and 74mm high. Inside is Roon’s own Linux based operating system (OS) hardened by an independent boot sector to make start-up assured should a software update fail or the machine be hacked in any way, Roon identifying a need for security in a product permanently on and attached to the internet. There are two models: Nucleus and Nucleus+. The first will suit most people Roon state, whilst the + version reviewed here is aimed at those who want all features, including high rate DSD – something that especially interests me. Internal storage can be on a removable/ upgradable solid-state hard drive (64GB SSD) or for more capacity a spinning drive (HDD), but the OS works best from SSD and a fast multi-core processor, meaning Intel i3 in Nucleus with 4GB RAM or i7 in Nucleus+ with 8GB of RAM. Roon software consumed 5GB of the 64GB SSD, and 35GB of music was installed, to give you some idea of real life capacities. Our DSD test tracks took up 4GB by the way. An easy and cheap way to expand memory would be a 128GB flash drive. Power is supplied by an external 19V switch-mode supply that, like most, accepts 100V-250V a.c. input, 50/60Hz, so will work anywhere. There is no drive for ripping CD – this must be done on an external computer. The company say that if you’re retrieving music from on-line sources like Qobuz or Tidal why bother ripping and storing it locally on Nucleus? Academic perhaps for most people who have already invested time and effort into getting their music collection onto a home hard drive, but a good point. Roon can see and play music in ‘watched folders’ but here things got rocky. A Mac (Sierra) and PC (Windows 10) both saw Roon as a storage drive and granted it access as a guest, through their firewalls without my intervention (how this happens I do not know). However, Roon did not see either; I was unable to search (browse) from Roon, instead having to enter folder paths – and no success here. The Mac did ask for the Nucleus password which was not obvious in Roon’s About info. Doubtless all this can be sorted out but Roon server was ‘computer-ish’ difficult here. It was both obvious and easy to load (copy) music files from Mac and PC directly onto Nucleus, then they were permanently available even with computers switched off. Or music can be loaded to a high capacity external disc drive connected via USB – at extra cost of course. Two USB ports are fitted and see mass storage or peripherals. A USB flash drive (memory stick) with music files was seen without problem. Also, I drove an Audiolab M-DAC+ through USB to audition the unit, and it successfully flagged up DSD 5.6MHz on its display when faced with double-rate DSD (DSD 128) from Nucleus+. There is an HDMI output and a high speed Thunderbolt socket too, both of which can handle audio and video – in this case album artwork etc. Nucleus did not have to be installed. I just plugged in an ethernet cable from my BT router and it was immediately identified on the router’s client list, and seen by both computers without further ado. Nucleus+ spotted both an Audiolab M-DAC+ on USB and a Leema Elements High Resolution Streamer on ethernet – accepting once given ‘zone’ names. You can use wi-fi bridges but I chose not to. Roon’s server software was disappointing after my experience of Roon on Mac (or PC) in last month’s review. 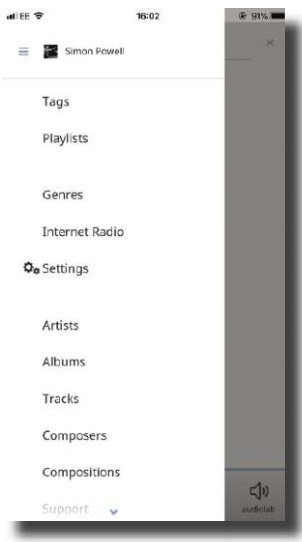 The initial access screen was poor on an iPhone – just a blank white area of almost randomly assembled text, ‘Settings’ for example being plonked into the middle of music access categories like Genre and Artists. The power switch at left lies in a recess with led downlight to indicate on status; Nucleus+ is designed to be left on. Power consumption is rated as 65W maximum. Flash storage must be inserted at rear; there is no front panel alternative. music players sort by folder and file contents in simple hierarchical fashion, Roon sorts primarily by metadata, reverting to file name as last default. Our Nucleus+ came loaded with 500 tracks for the convenience of reviewers/users and here I had fun. Peter Green and Fleetwood Mac. I spotted Green Manalishi amongst the tracks, from Peter Green’s Fleetwood Mac. Lurking unspotted was Black Magic Woman from Carlos Santana, a Peter Green composition. A Peter Green search brought up top result as Santana – no Green Manalishi because it had no metadata. Adding metadata to the track with Audacity and re-saving it dispelled the confusion. A lot of pre-loaded tracks lacked metadata I found – and this confused Roon. DSD review tracks (various) I loaded were identified as an album – ‘Kustbandet in Stockholm, various artists’. Don’t ask! Roon seemed to be piecing together bits of information to make a whole, sometimes with confusing results. The solution to the above is to preen album metadata, a big task when thousands of tracks might be stored. The start screen on an iPhone – not so attractive. And hierarchically illogical with Settings plonked in the middle. crude but subsequent play screens with music data were well designed and engaging. Roon server needs user interface development. But in the background its engine room worked well, delivering cover artwork, artist info and track format data. It’s best used to both store and deliver music, rather than watch local network files. And there’s no doubt that being available at networked computers and controllable from a wi-fi app is very convenient: definitely beats racks of CDs. Sound quality from Roon is hard to pin down. The ‘end point’ as Roon call it – meaning the DAC that feeds the hi-fi – ideally carries Roon end-point bit-perfect software, making it Roon Ready. This includes MQA processing at the end point as well as data checks. It’s what Roon want you to use – but Roon Ready DACs like Moon’s 280D fitted with Mind 2 module carrying Roon software don’t come cheap. Roon also recognises end­points without their software: both the Audiolab and Leema I used were seen and identified as such by Nucleus+. 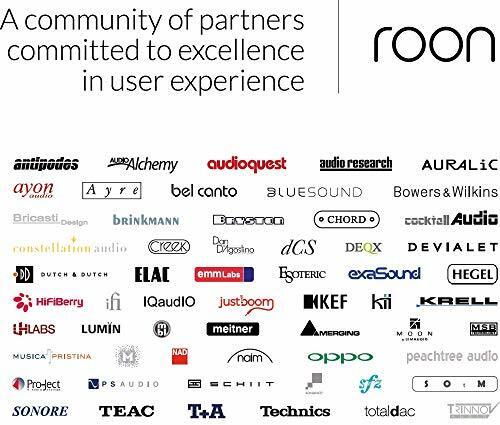 I had a very good experience with Roon on my Mac and – user interface apart – Roon server offered much the same assured quality through M-DAC+ (USB, driving headphones) and Leema Elements High Resolution Streamer (ethernet, driving Creek Evolution 100A amplifier and Martin Logan ESL-X hybrid electrostatics). Fleetwood Mac’s Go Your Own Way (24/96) and Santana’s Samba Pa Ti (CD) were well rounded, laid back – no harshness – and enjoyable. It additionally unfolds MQA and a suite of test files showed a profoundly smooth and easy sound, from Lise Granden Berg to Kyoko Tabe playing (sublimely) Beethoven’s Piano Concerto 5 Emperor. Roon’s Nucleus+ server has massive ability, but it is expensive and needy of a slicker user interface, if fine in speed and sound quality. A full Roon system demands use of a Roon Ready end-point (typically a DAC) equipped with their software, at extra cost. All the same, Roon server offers the convenience of network storage, control from an app via wi-fi, plus Roon’s ability to provide artist data and album artwork for a more engaging experience, across a home network. A powerful music server with massive capability, but needs a better user interface. Roon catalogues music using metadata, not file names – except as a last resort. But what is metadata and how do you read it? Metadata is data about a music file, such as singer, album title and track name. You can’t mix text about a song, such as who sang it, in with the music itself so this info resides in an separate but appended file. WAV, you will read, does not have metadata but in practice it does, whilst FLAC does have metadata, but in practice may not. Confusing. WAV is a traditional digital music file, containing pulse code modulation (PCM) info that all computers and DACs understand. It’s old and simple as digital goes. In original form it was just a music file – no metadata. Nowadays however, WAV commonly carries metadata within appended RIFF List and ID3 tags, so you do get metadata with WAV. FLAC has metadata con­tent as part of its spec., hence the assertion it carries metadata. Whether a file carries metadata or not depends upon whether anyone bothered to enter that data, more than whether the file format has the ability to carry it. Metadata carries info about the music track, but the data fields can be empty or full according to provenance. A dodgy digital recording will have no metadata because it is an adjunct to the recording process and a nuisance, but a commercial one will likely be loaded with metadata. See the metadata file for The Eagles Hotel California here. Roon tries to make sense of music by reading the metadata files. Potentially, they carry far more info than the simple file title. How to read metadata? I use Audacity, the free music editing software for Mac or PC. You can add metadata to music files, helping Roon make sense of what it is faced with.